The colors in our living room are going to be mostly neutrals like gray, cream, gold (yes, it's a neutral to me!) with a deep royal blue and blush pink as our accent colors. We also plan to have some black detailing (knobs on tv stands, possibly an accent pillow, etc) to really tie things together. The direction we're heading with the room is something I like to call rustic glam. I love the look of the farmhouse style (think Fixer Upper), however I can't ignore that glam is what I'm drawn to. I just love gold and marble too much, ha! A few of the pieces have more farmhouse-y charm than the others, for example the white cabinet, but the plan is to accentuate it with the more glam pieces: vases (the ones we bought are more glam than the ones here), gold bookends, chic coffee table books, etc. Although it will definitely take some trial and error to get the exact look, it will be so much fun getting there! The piece that really got the ball rolling on our planning was the blue couch. Our current couch is olive green/gray, something that is not my style at all. We got it at a great price as juniors in college and it's extremely comfortable, but I just am not a fan. A trip to HomeGoods solidified our idea when we came across two beautiful blue striped vases. That was when blue became a focal point of our new space. It might seem crazy, but we chose these vases then chose a couch, all before we have even looked at an apartment. What can I say, we know what we want and just got on a roll! After that the brainstorming was non-stop and this mockup was made that same night. 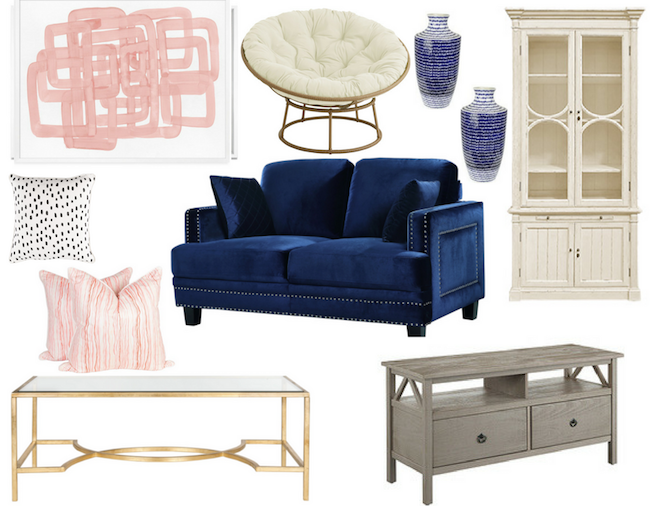 I can't wait to share more home decor updates as our big move gets closer! I also just can't wait to share more details about the move in general, but I'm sorry that's going to have to stay a secret for a little while longer! Oh these are all gorgeous pieces! I am drooling over that cabinet! ohh this is a dream! I love how classic it is while also being chic and modern! a velvet navy couch makes my heart melt! I have a blue velvet couch and it's one of my favorite pieces in my home. It's so beautiful! Can't wait to see the reveal! My dream living room would be white couches with rustic furniture which is what I'm working towards. Just hard to do the white couches with boys lol You have some great selections. That coffee table is so cute!!! I loved these pieces you picked out...especially the papasan! Don't see those enough these days. This is my dream living room too! We're moving soon and this gave me total inspo. Love the coffee table - I'm on the lookout for a deep, navy blue mid-century modern couch for my sitting room! Obsessed with you have picked out! I love that bright blue couch! I love the pink/blue/gold color combo! I think the throw pillows are my favorite! I don't have a living room, haha. But I always picture how my dream house would look like. those vases! I'm also really into doing a blue theme for my next living room, love how fresh it looks! I love the color palette so much! A statement couch like the one you pictured is going to be stunning in your new place. I want a velvet couch soo bad! That one is beautiful! I'm obsessed with that couch!! Girl this might be my dream living room too! (If i didn't live with my husband!) Great color palette, I love it! Ugh yes that blue velvet couch is amazing! Girl, gold is TOTALLY a neutral!! I really wanted all of the metal in my living room to be gold but sadly our theme lent itself more to a wrought iron look than anything. But I love your color scheme!